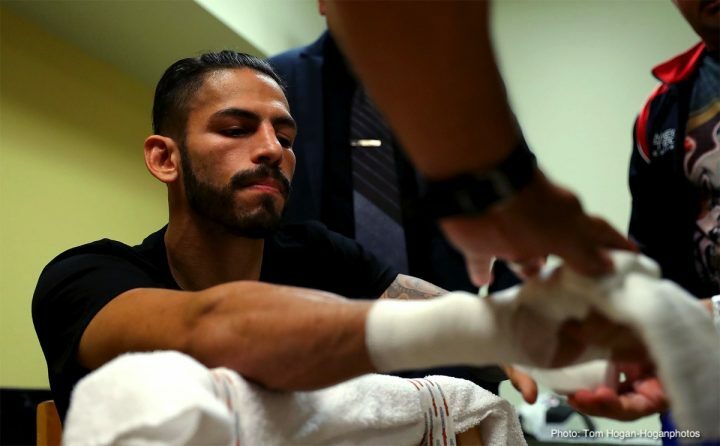 By Jim Dower: Jorge Linares (45-4, 27 KOs) now wants a rematch with Vasyl Lomachenko and Mikey Garcia after his 3rd round knockout win over light welterweight Abner Cotto last Saturday night in Indio, California. Linares, 33, knocked Cotto down three times in the fight before the fight was stopped in round 3. It was a blessing for the 31-year-old Cotto that the fight was waived off by referee Raul Caiz Sr. when it did, because Linares looked like he was just getting warmed up. The best was yet to come from Linares in the fight had the referee allowed it continue. The victory for Linares was his first at 140. He sent a strong message to the other fighters at light welterweight that he’s a force to be reckoned with. Linares wants another fight against 30-year-old Lomachenko, as well as a match against WBC lightweight champion Mikey Garcia. Linares, 33, says he would go back down to lightweight to fight Lomachenko and/or Garcia if the opportunities present themselves to him. It’s unlikely that Top Rank will let Linares get a rematch against the Ukrainian Lomachenko so soon after their fight last May, as it was a hard one for their fighter. Lomachenko took a lot of punishment and was knocked down in the 6th round by Linares. Top Rank has already scheduled Lomachenko to face World Boxing Organization lightweight champion Jose Pedraza in December in an in house unification fight. It’s unclear what Lomachenko’s plans are after that. Top Rank would like to match him against Manny Pacquiao, but that fight doesn’t look likely given Lomachenko’s request that the fight with Pacquiao be held at 135. Mikey Garcia is trying to put together a fight with either IBF welterweight champion Errol Spence or WBA ‘regular’ 147 pound champion Manny Pacquiao. Garcia has done a lot of talking, but thus far nothing has happened. It’ unlikely that he’ll drop the pursuit of those fights in favor of a smaller money match against Linares, who still needs to redeem himself with some important wins before he’ll be worthwhile to fight by the likes of Lomachenko and Mikey. It would be a bad look on Garcia’s part to take on Linares right now. Trying to negotiate a fight with Mikey could prove incredibly difficult for Linares. Unless he’s got a lot of time to kill with his career in negotiating endlessly with Garcia, he would be better off staying active and going after the light welterweight champions or better yet the winner of the World Boxing Super Series tournament in 2019. If Linares is flexible about fighting different guys, he should think about branching out to fight some of the welterweights as well. There’s a lot of different guys that Linares can fight at 147 like Danny Garcia, Brandon Rios, Devon Alexander, Jessie Vargas, Keith Thurman, Jamal James, Jose Benavidez, Jeff Horn and Terence Crawford. Basically, all the same guys that Mikey is available to fight, Linares can fight as well.